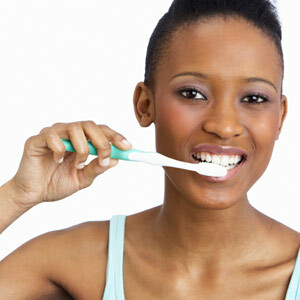 Daily personal care is essential for optimal oral health. Brushing and flossing in particular keep bacteria and acid, the main causes of dental disease, at manageable levels. But to gain the most benefit from your personal care, you need to perform these tasks effectively with the proper techniques and equipment. For most people brushing begins with a soft-bristled, multi-tufted toothbrush with fluoride toothpaste that helps strengthen enamel. You should hold the brush at a slight angle and brush with a gentle motion to remove plaque, the main cause of gum disease and tooth decay — if you’re too aggressive by brushing too hard or too long, you could damage the gums. You should brush no more than twice a day for two minutes, and at least thirty minutes to an hour after eating to allow saliva time to neutralize any remaining acid and help restore minerals to enamel. Although some people find flossing difficult to perform, it remains an important component of daily care. Flossing once a day removes plaque from between teeth where a brush can’t reach. If you need help with your technique using string floss, we’ll be glad to provide instruction at your next visit. If you have bridges, braces or other dental restorations or appliances that make string flossing difficult, you might consider other options like floss threaders or a water flosser. There are also dietary and lifestyle choices you can make to enhance your daily care: limit sugary or acidic foods to mealtime and avoid between meal snacks to reduce bacteria and acid in the mouth; drink water to keep your mouth moist, which will inhibit plaque buildup; and stop tobacco use, excessive alcohol consumption and chewing habits like clenching or biting on hard objects. Above all, be sure to visit us at least twice a year for cleanings and checkups, or when you notice abnormalities like bleeding gums, pain or sores. Keeping your teeth and gums healthy can be done, but it requires a daily care commitment. Performing these hygiene habits in an effective manner will help preserve your teeth for a lifetime. If you would like more information on effective oral care, please contact us or schedule an appointment for a consultation.